My family plays lots of sports, so using Gatorade powder mix, instead of ready made sports drinks, saves us a lot of money each year. I've been thinking a lot recently, with the severe heat wave we've experienced here in the Midwest, of ways to keep my family hydrated while they are out playing sports. Our family mainly plays tennis, with a little soccer thrown in, and tennis can be quite hot and sweaty, and my kids have practice at all times of the day, including the hot morning sun. Whenever anyone is out in lots of heat it is very important to keep from getting dehydrated, so you are less likely to suffer from heat exhaustion or other heat related illness. While I encourage our kids to drink lots of water before, during and after practices and games, they sweat a lot, and also lose electrolytes. Therefore, we go through lots of sports drinks in the hot summer months too. We used to buy liquid, pre-mixed Gatorade for them to take to practices and games, but that quickly became way too expensive. If you buy your sports drinks ready made you are paying extra for water and packaging, the bottles, every single time. What we discovered is to buy Gatorade powder, and add our own water (nearly free) and use our own sports bottles (washable and reusable) to keep the costs down. Each scoop of powdered Gatorade makes 1 quart (4 cups) of sports drink, which is typically enough for both my older kids for a practice. We buy the three pound tub of Gatorade powder mix, which makes 24 quarts, which is 6 gallons of sports drink. This cost us $8.48 at the store (I have found the online prices are too high, so definitely purchase at a store, not at Amazon or places like that), compared with the price of $3.78 per gallon for the liquid variety. That means to make the same amount of drink from the powder it costs only $1.41 per gallon. I calculated that the premixed liquid is approximately 2.5x more expensive! You can buy the powder in single serving packets, to put in bottled water, but frankly that takes away most of the cost benefit, and environmental benefits of the more frugal option. I will be the first to confess that the Gatorade powder and the ready-made variety don't taste exactly the same, so you will need to be prepared for the difference. However, we don't serve this as a drink option for anything but sports practices, and even then only when it is very hot and they will sweat quite a lot. Otherwise, water will do. The purpose of this drink is to keep the kids hydrated, not primarly its taste, and once you get used to it, it is just fine. 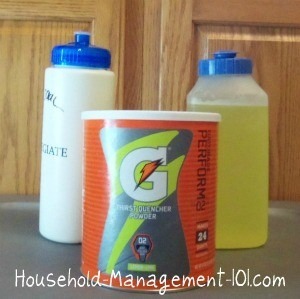 The scoop for the bigger Gatorade powder mix container is designed to make 1 quart at a time. I suggest you really measure out the water, to make sure you don't add too much powder, which will reduce your cost saving, but also over-concentrate the drink. It tastes better when cold, so either add some ice, in which case realize it will get a bit watered down, or make it ahead of time and chill in the refrigerator in anticipation for practices and games. You can also make extra, and it will keep for a day or two in the fridge, before it must be used if you don't need to use the whole amount all at once. I would love to hear from others, sharing how they save money with sports drinks, and to keep kids hydrated for less. Please tell me your frugal living tips in the comments! For example, does anyone have an even cheaper powdered mix they use, or a homemade Gatorade recipe they like?